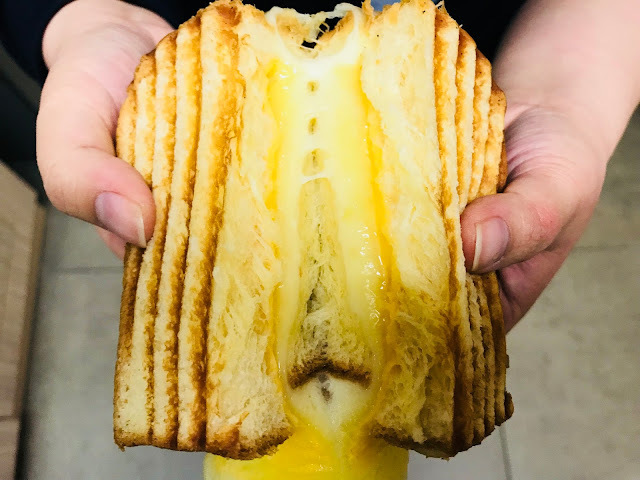 I have watched Say Chiizu Toast’s video on Facebook when it went viral on Facebook a few months ago and the stretchy cheese sandwich left a deep impression on me. 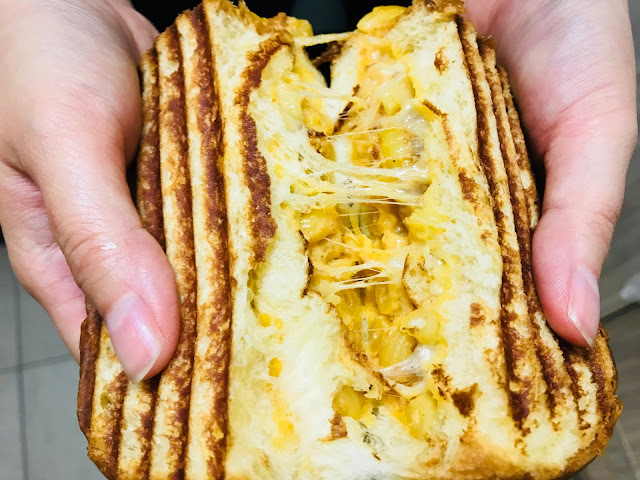 Ever since then, I was on the lookout for news of this grilled cheese’s entry into Singapore. 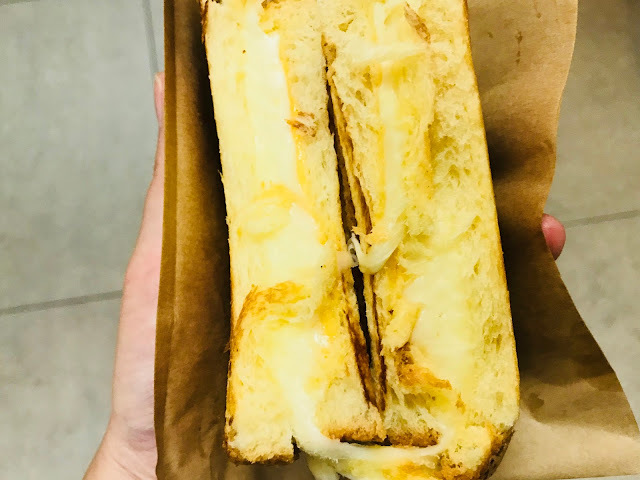 I was walking around the basement of Raffles City Shopping Centre one day when I saw that the spot previously occupied by Koki Tamagoyaki has been replaced by 52 Sandwich Shack and its 52 Grilled Cheese looks pretty similar to Say Chiizu Toast. 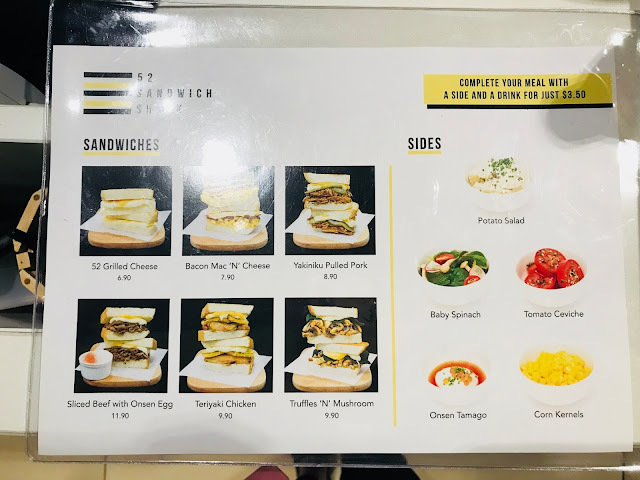 52 Sandwich Shack offers 6 sandwiches, namely 52 Grilled Cheese [$6.90], Bacon Mac ‘N’ Cheese [$7.90], Yakiniku Pulled Pork [$8.90], Sliced Beef with Onsen Egg [$11.90], Teriyaki Chicken [$9.90] and Truffles ‘N’ Mushroom [$9.90]. The helpful staff told me that the first 3 sandwiches are the most popular, so that’s what I brought. 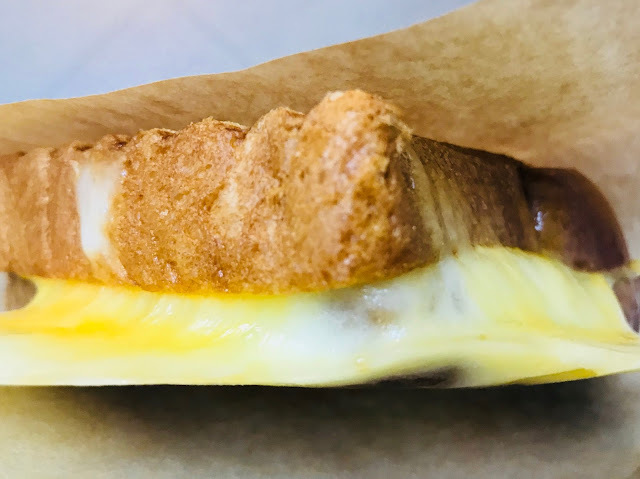 52 Grilled Cheese [$6.90] is the classic original version. Three types of cheese are used: cheddar for its popularity among Singaporeans, mozzarella for the stretchy pull of cheese and fontina to balance out the flavours. 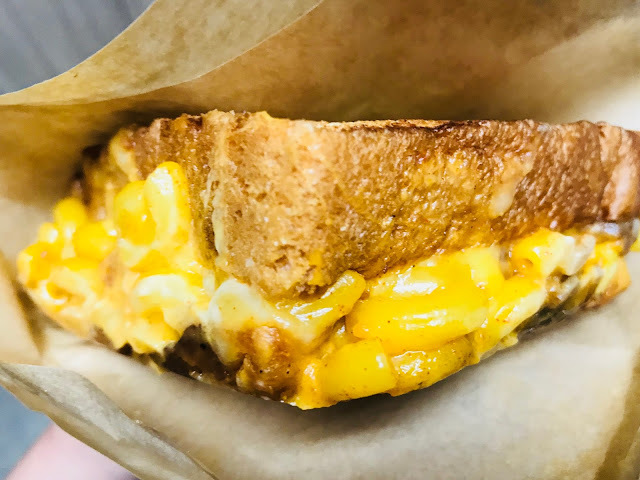 It is best eaten hot so you get the satisfaction of the gooey cheese in your mouth and it is also the best time to take a picture of the cheese pull. I like the combination of the 3 kinds of cheese that makes it cheesy but not overly heavy on the stomach. I am a little disappointed with the Bacon Mac ‘N’ Cheese [$7.90]. I can hardly taste the bacon and the 3 kinds of cheese totally cancelled out the mac and cheese. It is more like “52 Grilled Sandwich with Macaroni”. Yakiniku Pulled Pork [$8.90] is the most interesting of the three. Shredded pork is marinated in homemade yakiniku that gives the meat a delicious sweetness. 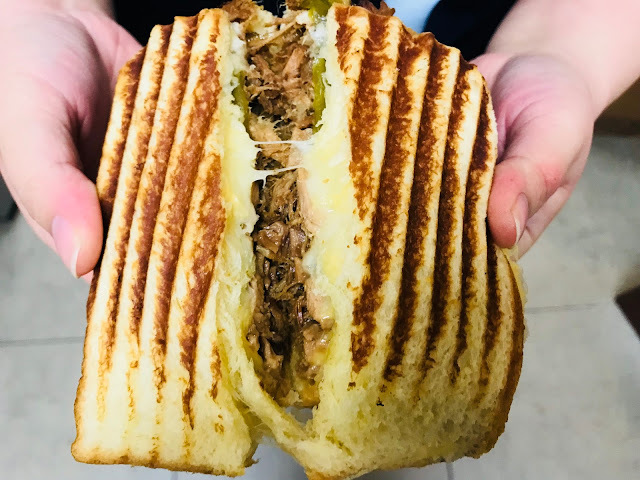 Paired with the 3 kinds of cheese and buttered brioche, the sweetness of the pork goes well with the cheeses, making this a tasty meal of its own. Besides sandwiches, 52 Sandwich Shack also serves breakfast from 8.30am to 11 am. 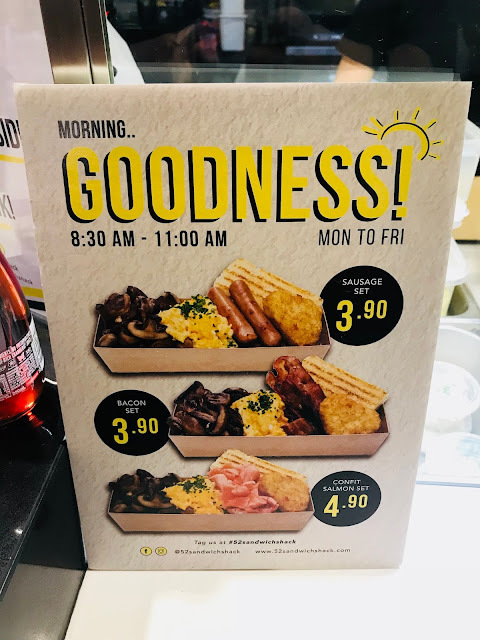 There are 3 options for choose from Sausage Set [$3.90], Bacon Set [$3.90] and Confit Salmon Set [$4.90] where sausage, bacon and smoked salmon is served alongside mushroom, scramble egg, brioche and hash brown. 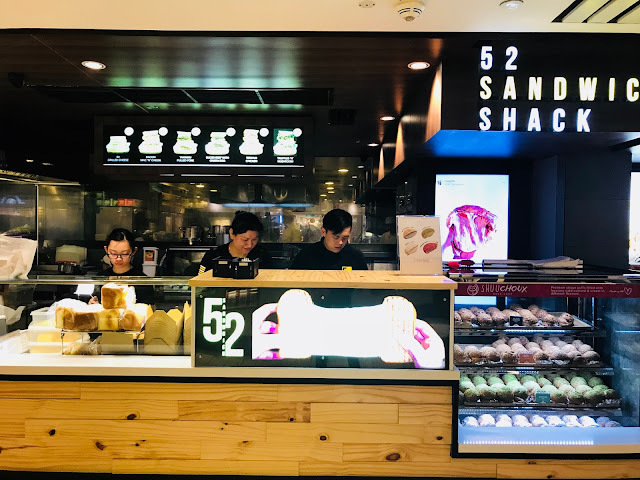 Although 52 Sandwich Shack is not Say Chiizu Toast, it does offer some pretty decent sandwiches which make for a tasty light meal or snack. Oh yes, Shuu puffs are still available at 3 for $12.